Friends! This post is a day late, for which I am eternally sorry; I was planning to finalize some things and get this up yesterday morning, and then we lost internet in a big storm on the islands on Saturday, and here we are. Anyway, I'm home now, and so so excited to be diving into Michelle Alexander's powerful book with so many of you. 1. Where do you plan on discussing this book the most? Feel free to share links to your blog, social media channels, snap handles, etc. I'll be chatting about the book here (with a mid-month discussion post coming on August 15th and a wrap-up post and link-up on August 31st), as well as on Instagram (@kerryamchugh), Twitter (@kerryamchugh), Litsy (@kerry) and Snapchat (@kerryamchugh). Don't forget to use the hashtag #SJBookClub for your own social posts so I can be sure to keep up! 2. Why did you decide to join in on the reading and/or discussion of this book? I decided to join because I'm hosting this little book club of ours, but I *picked* Alexander's book specifically because I thought it was important to delve into the inherently linked subjects of race and the United States' criminal justice system following yet another string of cases of police brutality last month. I've had The New Jim Crow on my to-be-read list for ages, and as much as I wish we didn't need this kind of book, I think we do. And we need it now. 3. In the very first line of the introduction to the book, Michelle Alexander writes, "This book is not for everyone." 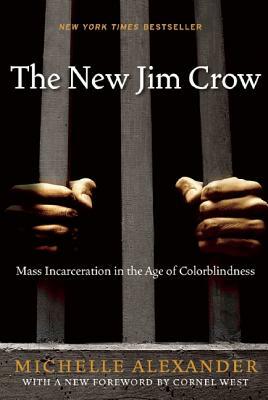 What do you make of that as a entree into The New Jim Crow? Personally, I appreciated Alexander's candor about the fact that this book is not going to change the mind of everyone who might read it. I think I generally fall into the second category of people Alexander is writing for--those who sense something is wrong, very wrong, with our status quo, but struggle to condense the facts and figures into a cohesive argument. I'm eager to understand how Alexander's research proves--or disproves, though I expect that won't be the case--the ways our current criminal justice system has been designed to target and imprison and disenfranchise a very particular race and class of persons in the United States. For those interested in more information about Michelle Alexander and her work, I recommend checking out thenewjimcrow.com, which has an excellent collection of Alexander's media appearances. Or check out this Frontline interview Alexander gave in 2014. It's not too late to sign up to participate in this month's reading! If you plan to read along on the same schedule as us, here's the plan for the rest of the month (and I promise not to be posting late again...). And if you've already read the book, please, don't feel like you can't participate in just the discussion posts. The more the merrier!